Always wanted to go to the Moon? Well, you can. Thanks to Google. When you follow the above link you will find that all lunar landing sites are relatively close to each other. So, there much of the Moon that still needs to be explored. I just found out about Google Pages. This is again something easy that the guys 'n gals at Google have thrown into the big pond. Well, hard to describe after using it only for 15 minutes or so. But it is another free place to set up your own web site with a simple CMS wrapped around it so anyone can now set up a website. You have 100 MB of space which should be more than enough for most users. And yes it is free. Now I will have to think of a good purpose for this. I guess I will come back on that one. FWIW I have created some pages here. I finally got around updating my template. The previous one was broken and all over the place. Now things should be tidier. There is still a problem (in wonderful IE!) with images that are wider than the main column. In Firefox the overflow:hidden is nicely adhered, but IE just plainly ignores this. Any suggestions on how to fix this for IE are welcome! It is not yet finished but finished enough for the time being. In case anyone was wondering about the specifics. It is source ordered three column layout. Based on a design by Blue Robot. That I fiddled just a bit to make it what it is now. I might just take this template and put it up for download on my site. If anyone is interested drop me line. Just giving away another bit of my "secrets" ;-) After my first and second entry on results and the meaning of Google Analytics this time just a short one. It had disappeared for some time from Google Analytics (servers overloaded?) it has now returned in full fashion. The site overlay gives a very easy to read report. It shows a page of your site in mini browser control and on all the links it shows how many people have clicked on each. It is very intuitive. This screen allows you to navigate your site while viewing traffic and conversion data for each link. The exit rate for the page is shown on the upper right corner of overlay. The blue and green bars are graphic indicators of clicks and quality, respectively, for each link on the page. Click on any set of blue and green bars to view metrics for that link: the number of clicks, the conversion rates for each goal you have defined, and the $Index. Links with the highest $Index are those links most commonly visited prior to high-value conversions during a visit. Click on any link to navigate to that page. Well, it gives you an easy overview of where the clicks went from any page to another page within your site. It also has the exit percentage so you know how many people just plainly left your site. 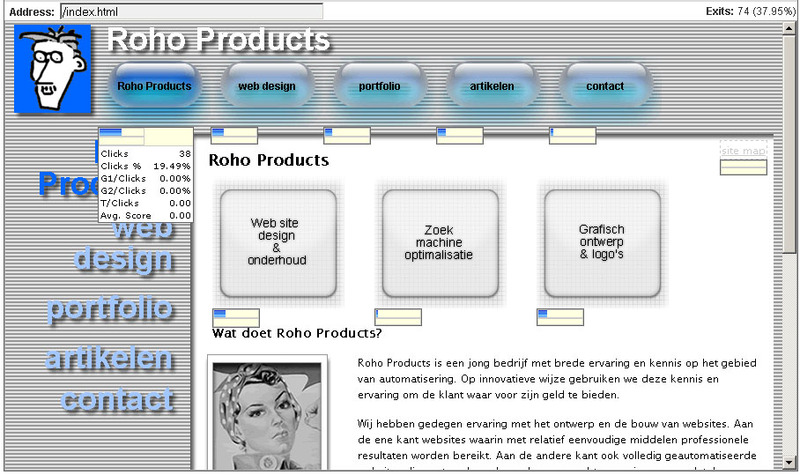 The screen shot of the index page of the Roho Products website shows that still quite a bit people are leaving and that also quite a few people (almost one in five) click on the link that leads to the page itself. I do hope Jacob Nielsen does not read this! More evidence that my home page needs a redesign. And in fact I am now in progress with a new home page that will come in front of this one. That new index page will try to better gauge the visitors to the pages that I would like them to see. Unfortunately Roho does not make the cushion I have, it was a prototype. Unfortunately Roho has learned that two new delivery trucks, a necessity for the lunch delivery service, will cost a total of $24,000. Well, unfortunately Roho woke up with a very bad cough Saturday morning and Kirah spend the day nursing him. Well, unfortunately that is all Google or any of the other search engines come up with. Fortunately Roho was just at the edge of the ice, so he doesn't encounter any further patches during his retreat. Fortunately Roho had purchased an extended warranty when he bought his system, which promised to exchange it should it suffer from any major component failures. Which has learned me that there is a thread about Roho at sinai.critter.net and Brendan's Journal is located at roho.livejournal.com ?! Unfortunately Rob was apparently caught in a weak moment. Unfortunately Rob D. just wasn't who he once was and was back for only five months. Unfortunately Rob walked in. Fortunately, Carly was right beind Rob. Unfortunately Rob had moved his small unit of light cavalry into the path and charge range of a Sasanian elephant. Unfortunately Rob never gave me any evidence for his assertions but merely said my comments were evidence enough. Unfortunately Rob, you cannot produce evidence of that success you claim. Unfortunately Rob himself has indicated that the cut off for well-defined predictions regarding meteor trails seems to be at around a ZHR of 500 and the distance between last year's 4-revolution trail and Earth was a relatively large +0.0016 a.u. Unfortunately Rob as very little information to go on, other than the photograph attached and that his father was Polish and stationed in England. There are probably plenty more out there. .. or have you already moved on? Do the logos below mean something to you? Are you familiar with ten or more? If they do make sense you are definitely into Web 2.0. Or maybe within this collection of logos is the selection of companies that will be around in five years and be part of the Internet establishment. 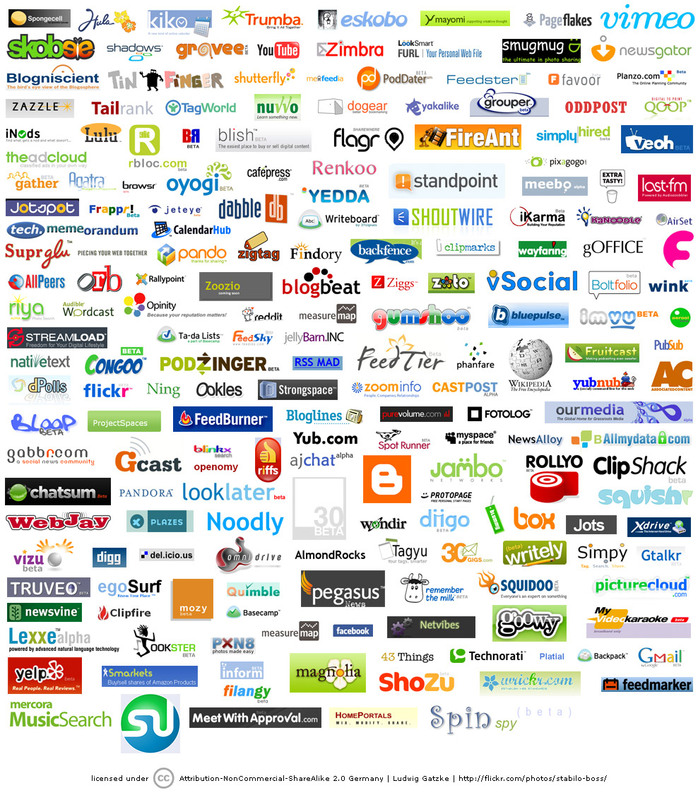 Most of them will likely have been superseded by better Web 3.0 or Web 4.0 incarnations. Sometimes you find the most interesting sites by chance. This one was supplied by one of my colleagues. The Daily WTF reports on Curious Perversions in Information Technology and that is fun to read. In a recent post the concept of 'stickiness' was mentioned. With this performance parameter the lasting appeal of a site is described. How much does the site makes the visitor read more than just the page it landed on. In the post the value of Average Page views was suggested a the 'stickiness factor' Using Google Analytics one can find the value of this parameter for your site. Looking at at my blog I think the values are always between 1 and 2. Which as suggested by the articles is quite normal for blogs. A user reads maybe one or two posts and leaves. Or also probable the regular visitor uses the RSS feed to stay up to date with your ramblings. On my web site it appears that the average user views 2, 3, 4 or even 5 pages per visit. This is an all together different type of visitor. 'Stickiness' has been coined more or less as the ability of a website to keep customers at your site. Let's call this the 'stickiness in visit' factor. I think there is another aspect that is closely related that describes the ability to get people coming back to your site: some sort of 'stickiness in time'. In other words: How much of your visitors return for another visit? This is also easily shown in Google Analytics in the new vs returning visitors report. On my blog I see a returning visitors percentage of about 38%. Which I think is a reasonable figure. Readers who really want to follow what I am blogging about will also use the RSS channels and thus will not show up in these statistics. But as this is not measurable you will never know whether it's just one user (your mom) or a million visitors around the globe. On my site the numbers are different. As one would expect. The content is not as often updated and it is an all together different purpose it serves. It is more intended as a brochure for my web design activities. I have about 12% returning visitors. Which means that by far most visitors to my website are new. That is good as I try to reach more and more potential customers. I do not want only returning visitors (my family and neighbor's) I want new clients and more work! If you need any website design or producing valid html+css from a design then contact me! Having seen the above 'stickiness' factors one can wonder what are optimal values. The optimal values vary strongly per type of website. blogging site: for a good blogging site visitors will hopefully return to read more and each visit will probably mean one or two pageviews. You expect the average pageviews to be between 1 and 2.
brochure-type site: on a brochure type site you want to inform the world of what you do and how good you are at it. But in the end you want people to contact you to do that thing for them. You would like them to move about your site and finally go to the contact page and act. This will mean that the average pageviews will ideally be over 3.
e-commerce site: ideally a visitors finds what he wants to buy in just a few steps (two or three) and then the checkout process which involves another couple of steps. This brings the average pageview to starting from 4 upwards. If it is more around 2 then you will probably not be selling much and visitors are not finding the stuff they need. You either do not have it or you have hidden it carefully. Again the optimal values for 'stickiness in time' vary strongly per type of website. blogging site: for a good blogging site visitors will hopefully return to read more so you would want to aim for a big percentage of returning visitors. Values should likely be over 30%. brochure-type site: a brochure site is aiming at raking in new clients and returning visitors is a prime target. Returning visitors will hardly be more than 15%. e-commerce site: An e-commerce site wants to sell and returning customers are satisfied customers, so returning visitors to the site is again a good sign. The returning percentage may not be as high as the blogging site but should be higher than that of a brochure site. An excellent story on the coming about of Firefox.